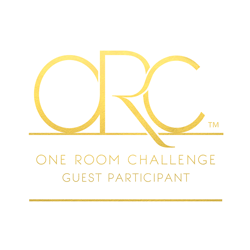 I’m back for week 2 of the One Room Challenge™ hosted by Linda from Calling it Home. Last weekend, I worked hard to finish up all the painting in the room, and apply the wallpaper. I’m LOVING how my Girls Bedroom Makeover is coming along so far, and I can’t wait to get a few more projects under my belt to see it all take shape. Be sure to check out all the amazing featured designers participating in the ORC and the hundreds of guest participants that will be linking up on Thursday. 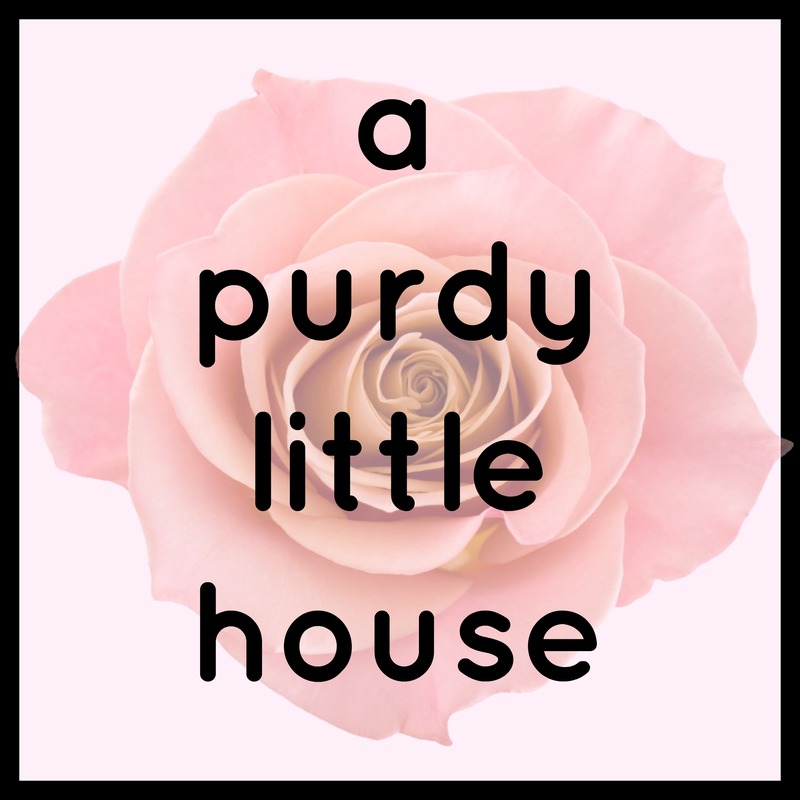 If you’d like to check out all the Before pics from Week 1 – click here —-> Girl’s Bedroom Makeover – Preppy, Stylish & Modern. Ok, so I’ve definitely taken some liberties here, but this shows a bit of the look I’m going for with the space. I have an old retro modern dresser that I have to paint, but the drawers are white, and this was the closest one I could find to give a sense of the look. Also, the hutch in my daugther’s room doesn’t really look like this white one, but again, it was the closest thing I could find. The one I’ll be using is actually in the pic below. 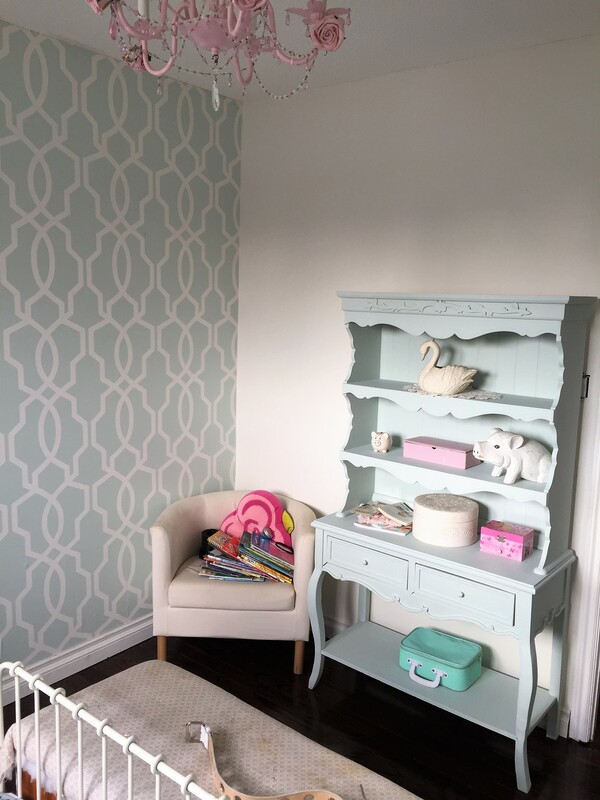 I’m loving how the pretty white paint and mint trellis wallpaper have turned out, but I have an issue with this chair. 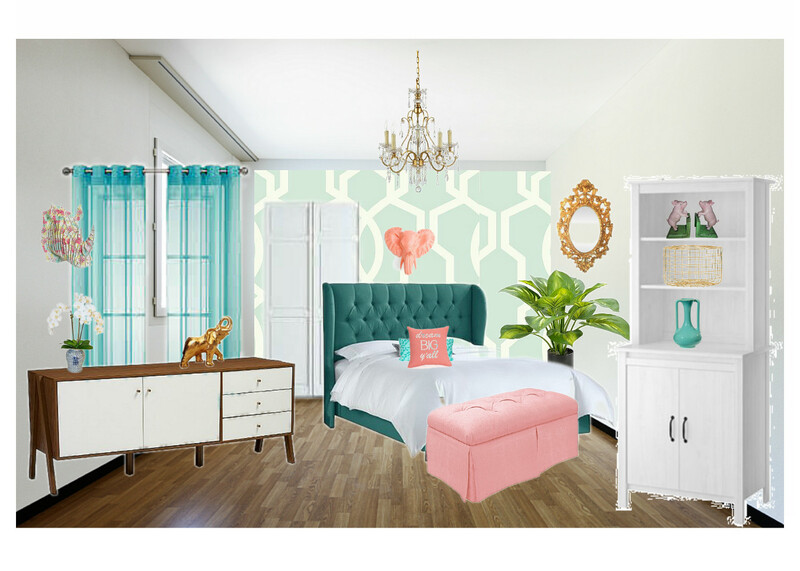 I created this room plan using the Pottery Barn Room Planner, which is a handy little tool for space planning. This room is teeny tiny and I need to maximize every square inch. See how the chair is touching the shelf? 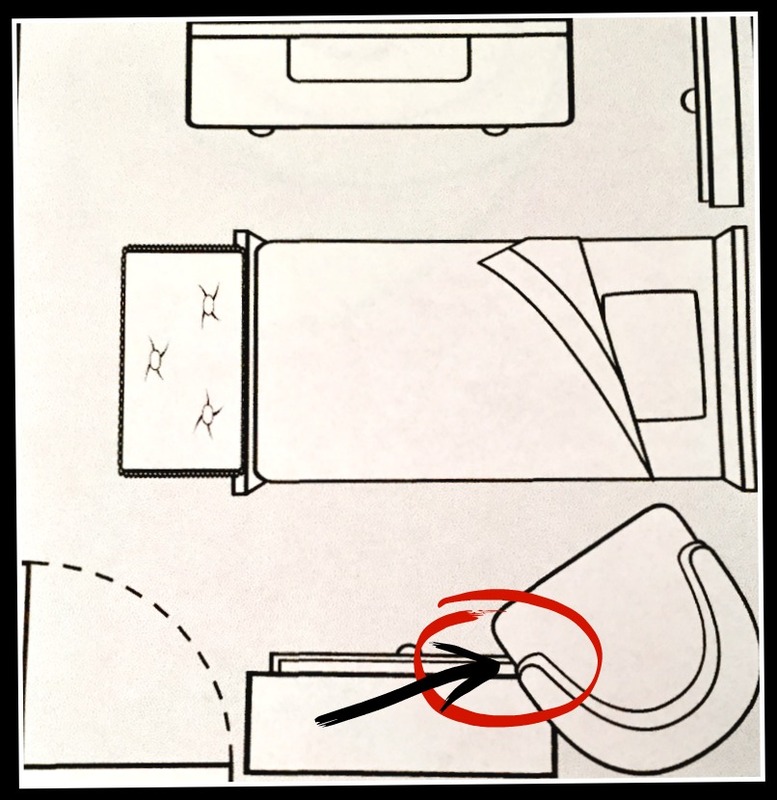 I hate that, and since there won’t be any space for a night stand I’ve decided that the chair will have to go. Boo! I even had my little one join in on adding the second coat of paint. I swear this wallpaper was a temperamental &$&$$&^ to install. If wallpaper was a teenage girl, this would have been it!!! It was obstinate, it didn’t do what I wanted it to do, it made a big mess, it caused me to yell and scream, and it wouldn’t listen! I love how it looks in the end, but it was honestly NOT fun to install and I’ve realized that I very much prefer the pre-pasted wallpapers. Why don’t they all come that way? I still need to do some work on the seams, but it’s getting there. I’m also planning on doing something to the closet door. Perhaps I’ll wallpaper it and add trim to the edges, or do a board and batten type thing on the closet by painting the door a mint colour and the board and batten in a crisp white. Still undecided. I love the wallpaper! It reminds me of one I had years ago in our bedroom. This room will be lovely when it’s finished! Well for all your efforts the wallpaper came out amazingly! The room is looking great Sue! The wallpaper looks amazing! I really love the color and pattern that you picked. Good luck upholstering the bed this weekend! It looks great! I love how wallpaper looks, but I’ve always been scared to put it up- it just looks so tricky! I can’t wait to see how the upholstered bed turns out! That’s a lot of work done in week 1! I know you said the wallpaper was a pain in the tush, but it really looks beautiful. And the hutch is just adorable. Her room is going to be incredible when you’re done. The wallpaper is so pretty, you did a great job installing it! Your little helper looks so cute hard at work. Thanks so much Julie. I’m happy that it’s all turning out so well and thankfully my daughter really likes it. Whew!! That wallpaper really packs a punch! I’m loving it! Thanks so much 😉 I have three girls and the oldest one is a teenager. It’s a wild ride for sure and it’s going to get crazy when they’re all teenagers at the same time. I’ll need wine…. lots and lots of wine. Lol.